Since 1951, the Michigan personal injury and family law attorneys at Sinas Dramis have represented countless individuals, obtaining noteworthy verdicts and settlements on their behalf. As a result, our attorneys are recognized as leaders in Michigan personal injury and family law — leaders who have earned the respect of judges, the legal community, lawmakers and the public. Here is an overview of the achievements and honors that our firm and its attorneys have received over the years. Presidency, State Bar of Michigan – Michigan’s legal profession is overseen by the State Bar of Michigan, the organization that licenses all practicing attorneys in the state. The State Bar president serves for one year. From 1988-1989, former Sinas Dramis partner Donald L. Reisig served as president of the State Bar. 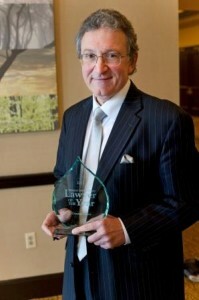 George Sinas was named the 2013 “Lawyer of the Year” by Michigan Lawyers Weekly. Presidency, Michigan Association for Justice – The largest association of attorneys who practice plaintiffs’ personal injury law is the Michigan Association for Justice (MAJ). The organization was formerly the Michigan Trial Lawyers Association. The competence and professional standing of Sinas Dramis in the field of personal injury law is reflected by the fact that three of the law firm’s partners have been elected as president of the MAJ.
Presidency, Ingham County Bar Association – Most lawyers practicing in the greater Lansing area are members of the Ingham County Bar Association. Several of the firm’s partners have been elected to serve as president of the Ingham County Bar Association. Chair, State Bar of Michigan Negligence Law Section – The State Bar of Michigan offers its members various practice sections to which they can belong. The section dealing with personal injury law is known as the Negligence Law Section. Both plaintiffs and defense lawyers who practice personal injury are typically members of this section. Two Sinas Dramis partners have been elected to serve as chair of this section. Leo A. Farhat Outstanding Attorney Award – The Ingham County Bar Association’s “Leo A. Farhat Outstanding Attorney Award” is given annually to an attorney who exemplifies the highest standards of professional competence and ethical integrity. Several Sinas Dramis partners have been honored with this prestigious award. Most Respected Advocate Award, Michigan Defense Trial Counsel – The Michigan Defense Trial Counsel (MDTC) is an association of attorneys who focus their practice on defending personal injury lawsuits. Each year, the MDTC honors a plaintiffs’ attorney who encompasses the highest standard of competence, integrity and civility. Two Sinas Dramis partners have received this prestigious award. Brain Injury Professional Service Award, Brain Injury Association of Michigan – The Brain Injury Association of Michigan is the largest brain injury association in the United States. Every year, it bestows its “Legacy Society Professional Service Award” on a professional who has made significant contributions benefiting individuals who have sustained traumatic brain injuries. One Sinas Dramis partner has received this honor. Best Lawyers in America (Michigan personal injury law, Michigan family law) – A peer review organization called “The Best Lawyers in America” conducts an annual survey of attorneys across the United States to determine the top lawyers in each state in various practice areas. Five of the firm’s partners have been listed in “The Best Lawyers in America” in the field of plaintiffs’ personal injury law and family law. 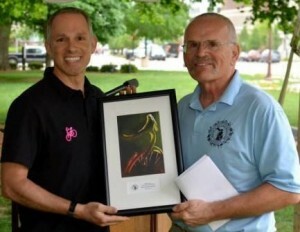 In 2013, Bryan Waldman received the Bicycle Advocacy Award from the League of Michigan Bicyclists. Michigan Super Lawyers – A peer review organization called “Super Lawyers” surveys attorneys across the United States to determine the top attorneys in each state in various practice areas. Over the years, several Sinas Dramis partners have been listed in “Super Lawyers” in the areas of plaintiffs’ personal injury law and family law. Lansing, Michigan Personal Injury Litigator of the Year, Best Lawyers – The peer review organization known as “The Best Lawyers in America” recognizes outstanding litigators in various practice areas. Two Sinas Dramis partners have received the “Best Lawyers in America – Personal Litigator of the Year” award for Lansing, Michigan. Lansing Lawyer of the Year – Domestic Relations Law, Best Lawyers – The peer review organization known as “The Best Lawyers in America” recognizes outstanding litigators in various practice areas, including family law. One Sinas Dramis partner has received this designation. Most Influential Attorneys, Michigan Lawyers Weekly – Michigan Lawyers Weekly, a statewide legal publication, has published a list of “Michigan’s Most Influential Attorneys.” Two Sinas Dramis partners have received this designation. Champion of Justice, Michigan Association for Justice – This honor is given annually by the Michigan Association for Justice. The recipient is a person who is committed to preserving the civil justice system and the rights of citizens. A Sinas Dramis partner has received this award. The Sinas Dramis Law Firm was featured in the very first issue of Leading Lawyers Magazine – Michigan Edition. AV Preeminent Rating, Martindale-Hubbell – Attorneys who receive the Martindale-Hubbell AV Preeminent Rating have been recognized as achieving the highest level of professional excellence. An attorney’s legal knowledge, analytical capabilities, judgment, communication ability and legal experience are all considered. Numerous Sinas Dramis attorneys have received this designation. Leading Lawyers in Personal Injury Law, Leading Lawyers Network – Membership in “Leading Lawyers” is reserved for less than 5% of lawyers licensed to practice in a particular state who are nominated by their peers. 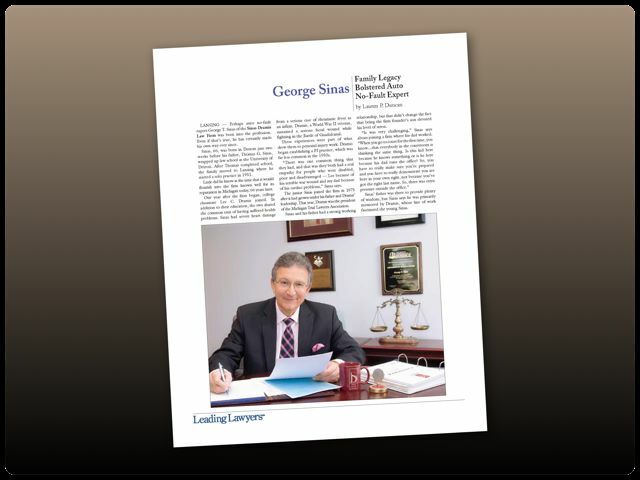 Several Sinas Dramis attorneys have been recognized as “Leading Lawyers.” In addition, Sinas Dramis was prominently featured in the 2017 inaugural issue of “Leading Lawyers – Michigan Edition” magazine. Top 5 Under 35, Ingham County Bar Association – Given by the Ingham County Bar Association, this award recognizes younger attorneys who have demonstrated character and integrity, as well as service to the legal community and general public, and who have a reputation for advancing the highest legal standards and professional ethics. Two Sinas Dramis attorneys have received this award. Over the years, the firm itself has been recognized for its achievements and dedication to providing outstanding legal representation to plaintiffs and their families. 2011 Legislative Tribute, Michigan Legislature – In recognition of 60 years of service to the people of Michigan, on September 16, 2011, the Michigan Legislature passed a special tribute resolution honoring the Sinas Dramis Law Firm. 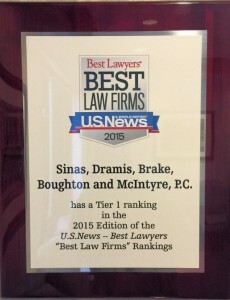 Tier 1 Ranking – Personal Injury and Family Law, Best Law Firms – Based on client feedback and input from fellow attorneys and law firms, the Sinas Dramis Law Firm has been awarded a “Tier 1” ranking in the areas of personal injury and family law in the Lansing area. Pro Bono Circle of Excellence, State Bar of Michigan – Sinas Dramis is one of numerous Michigan law firms and corporations listed as part of the State Bar of Michigan’s “Circle of Excellence.” These entities have donated time and/or money to providing legal services to low-income individuals or families, or have provided legal assistance at no cost or for a reduced fee.